While on a school mountain trip in 1983, I learned that my Judy Blume library was short one book: Forever. I was twelve years old when I discovered this glaring omission and immediately set out to rectify it. Reading a borrowed copy on my bunk during rest hour, I was interrupted by a parent chaperone, who was aghast that I was reading such a scandalous book. Chaperone: I am going to have to take that book from you. Me: Why? It’s Judy Blume. Chaperone: That may be, but I cannot imagine that your parents would approve. Me: Do you even know my parents? Chaperone: Well…er…no. But that makes no matter. This just isn’t an appropriate book for a young lady to be reading. Me: It so happens that my parents allow me to make my own reading selections. They don’t believe in literary censorship. It was true. My parents really didn’t limit my reading and made their entire library available to me. There were many books I read that contained material that simply went right over my head. My parents answered any questions I had though more often than not, I wasn’t even aware that I had missed anything. Though I didn’t know it at the time, Forever was a highly controversial book and the chaperone was not alone in her disapproval. Her reaction, however, deepened my resolve to read it regardless of the consequences. I honestly cannot recall how the book ended up back in possession. Did I mention that this mountain retreat was for the “Good Citizen” award winners for that trimester? So it seems unlikely, and highly uncharacteristic, that I would have taken it from among the chaperone’s belongings. What I do recall is that I had never read anything like it. The descriptive language was so palpable that I felt as if I was in the room with the characters. Though inexperienced, I could relate to the breathless feeling that comes with the blush of first love. But what I took away from the experience was that there are people who fear the written word. Because ideas become powerful when they are committed to paper. Which is why Banned Books Week is observed this week each year. To fight the narrow-minded fear. A version of this appeared originally on Frume Sarah’s World (08/03/10). 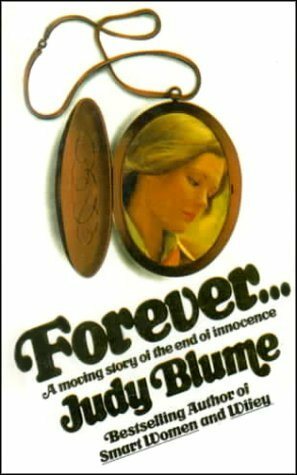 Ah for the times when the dirtiest thing a 12-14 year old could acquire was “Forever” – not Judy’s best book at all, but the one I learned the most from — except for “Then Again Maybe I Won’t”. I recently had lunch with a very respected professional who holds several degrees. I was shocked when she told me that her mother had censured her reading material until she had completed her undergraduate education and moved out of her parents’ home. I shared with her our philosophy concerning our children’s reading, as you so beautifully describe here. Ahh . . . FOREVER. I loved that book so much. I remember reading it at camp. We passed it around!